Background: Transarterial chemo embolization (TACE) is recommended for hepatocellular carcinoma (HCC) patients with well-preserved liver function. In Thailand, TACE is occasionally performed in decompensated cirrhosis due to limited resources. We compared overall survival by TACE in HCC patients with decompensated cirrhosis to those with compensated cirrhosis. Methods: A retrospective cohort study was conducted at a tertiary hospital. HCC patients were recruited from January 1, 2007 to December 31, 2016 and divided into 3 groups by Child-Pugh scores A, B (7), and B (≥8). Overall survival was the primary outcome. P<.05 was considered statistically significant. Results: A total of 331 hepatocellular patients were included: Child A (66%), Child B (7) (20%), and Child B (≥8) (14%). The mean (SD) follow-up time was 20(16)months and the median survival times were 22, 13, and 12months in Child A, Child B (7), and B (≥8), respectively (P<.001). In comparison between Child B (7) and Child B (≥8), the overall survival rates did not reach statistical difference (P=.91). The overall survival rate in a subgroup of patients with Child B (9) was the worst. Predictors for survival were high serum albumin, tumor size<5cm, TACE frequency >2, multimodality treatment, and absence of complications. Conclusions: TACE can be performed in HCC patients with early de compensated cirrhosis (Child-Pugh score 7–8) resulting in a 1-year survival close to that of Child A. Regarding conflicting Child-Pugh score recommendation for TACE, our study suggests that TACE can be performed in patients with Child score of up to B8. Early de compensated cirrhotic patients with liver cancer have more option of treatment by TACE. Liver cancer is the sixth most common cancer worldwide and the second most common cause of cancer-related death. More than 90% of liver cancers are hepatocellular carcinoma (HCC).1 Staging is currently based on the Barcelona Clinic Liver Cancer (BCLC) staging system which includes tumor burden, liver function, and patient performance status. Treatments are stratified according to the BCLC stages.1,2 Tran arterial chemo embolization (TACE) is a modality of choice for HCC patients with BCLC stage B (intermediate stage). TACE can also be applied in very early and early stage HCC when surgery or loco-regional therapies are not eligible due to tumor location or medical comorbidities.3 TACE was initially proved to improve survival in HCC by several studies; however, most of the patients in these studies were in Child A.4‒7 According to the guidelines, TACE is recommended for Child A and highly selected Child B by the American Association for the Study of Liver Disease,1 for Child A by the European Association for the Study of the Liver,2 and Asian Pacific Association for the Study of the Liver.3 Thailand guideline 2015 states that patients with Child ≥9 are an absolute contraindication for TACE. In Thailand, most HCC patients often come with late presentation; therefore, they tend to be in the intermediate to advanced stage and have impaired liver function.8‒12 From the experience in our institution, TACE is sometimes applied to patients beyond the criteria due to ineligibility of other loco-regional therapies and limited access to sorafenib or liver transplantation. Some Child-Pugh B patients with scores of 8 or 9 undergo TACE with questionable outcomes. Few studies, so far, have clarified the effect of high Child scores on the outcome of TACE and the results are conflicting. Therefore, we aimed to study the outcomes of TACE in HCC patients in terms of overall survival among different Child scores and to determine the predictors for survival at a tertiary care hospital. Patient characteristics, laboratory results, and radiological data were reviewed from the computer-based medical records. Patients were divided into 3 groups by their liver reserve using the Child-Pugh scoring system: A, B (7), and B (≥8). Comorbidities were cardiovascular, cerebrovascular, and metabolic diseases. Doxorubicin was used as a chemotherapeutic agent in all TACE patients. Patient status at the end of the study (November 30, 2017) was defined as alive or death using data from the Thailand civil registration database. Complications were defined as TACE-related complications or liver decompensating (increase in Child score ≥1) at 4–8weeks after TACE. Overall survival was measured from the date of diagnosis to the date of study termination. The study was approved by the Human Research Ethics Committee of Prince of Songkla University. Statistical analyses were performed using R program version 3.4.1. Data were demonstrated as mean (SD), median (IQR) or percentage as appropriate. Comparisons of means, medians, and percentages among the 3 groups were done by one-way analysis of variance (ANOVA), Kruskal-Wallis test and Chi-square test or Fischer’s exact test, respectively. Overall survival was analysed by the Kaplan Meier model and compared by log rank test. Predictors for survival were explored using Cox’s proportional hazard model. P<.05 was considered statistically significant. After searching the hospital database and performing a medical record review, 331 hepatocellular patients who underwent TACE were included in the study. The mean (SD) age was 60(11). Most of the patients were male (72%) and 90% of the patients had cirrhosis. About half of the patients had hepatitis B (49%) as a HCC risk factor, followed by alcohol (23%), hepatitis C (20%), and nonalcoholic fatty liver disease (8%). When the patients were grouped according to their liver function reserves by the Child-Pugh score, the percentages of patients who were Child A, Child B (7), and Child B (≥8) were 66%, 20%, and 14%, respectively. The majority of the patients in each group were BCLC stage B. The percentage of patients who had TACE as monotherapy was 64%, while the others had multimodality therapy including liver resection, percutaneous ethanol injection, radiofrequency ablation, and sorafenib. The mean TACE frequency was 2. The mean (SD) follow-up time was 20(16) months. Patient baseline characteristics are shown in Table 1. *Statistical significance, **Median (IQR), ***Mean(SD), Multifocal tumor; tumor number ≥2, tumor size; size of the largest tumour. For all 331 patients, the median survival time was 17months. One- and 2year survival rates were 59% and 41%, respectively. In terms of primary outcome, the median survival times were 22months in Child A, 13months in Child B (7), and 12months in Child B (≥8). The 1- and 2-year survival rates for Child A, Child B (7), and Child B (≥8) were 63 and 48%, 51 and 29%, and 49 and 26%, respectively. Overall survival was statistically different among the 3 groups by log rank test (P<.001) as shown in Figure 1. In comparison between the Child B (7) and Child B (≥8) groups, the overall survival rates did not reach statistical difference by log rank test (P=.91). Figure 1 Kalpan Meier curves of overall survivals in child A,B (7), B(≥8). 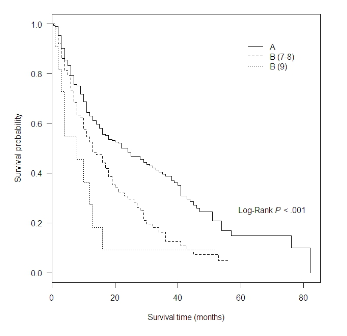 When we re-stratified the patients into Child A, Child B (7–8) and Child B (9), a statistical difference in overall survival was found with the worst survival in Child B (9) (P<.001) as shown in Figure 2. The median survival time was 22months in Child A, 13months in Child B (7–8), and 8months in Child B (9). The 1 and 2year survival rates for Child B (7–8) were 52 and 30%, respectively, while the 1-year survival rate for Child (9) was 27%. In a comparison between Child B (7–8) and Child B (9), overall survival did not reach statistical difference by log rank test (P=.14). Figure 2 Kalpan Meier curves of overall survivals in child A, B (7‒8), B(9). TACE frequency, multimodality treatment, and complications, including liver de compensation, were not different among the 3 groups. Death outcome was more common in Child B (≥8) and B (7) than in Child (A). Most of the patients in each group had progressive disease according to the modified Response Evaluation Criteria in Solid Tumors (Table 2). By multivariate analysis, high serum albumin, tumor size<5 cm, TACE frequency >2, multimodality treatment and absence of complications were predictors for survival (Table 3). From the baseline characteristics of our patients, most of the liver biochemical profiles, the presence of as cites, and cirrhosis were statistically different among the 3 groups, which was compatible with the grading of the Child scores. However, tumor burdens, including size, number, multimodality, and vascular invasion which are important factors affecting survival, did not differ among the 3 groups. TACE was performed most frequently in patients with BCLC stage B(44%) followed by stage A(29%) which was consistent with the treatment allocation suggested in the BCLC guideline. 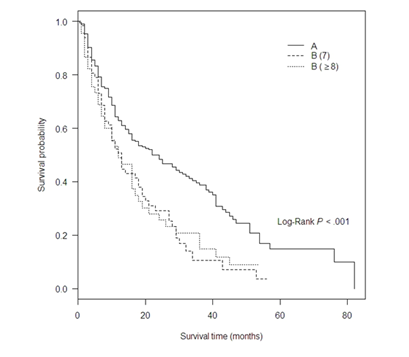 The median survival time of all patients was 17months. Since the majority of the patients were BCLC stage B, it corresponded to 16–20months of BCLC stage B reported in the guideline.2 Some of the patients with BCLC stage C(22%) underwent TACE because of limited access to sorafenib and the results showed a median survival time of 7.5months, which was comparable to 6.5months in a study by Cheng et al.,18 despite fewer Child A(65%) in this study group compared to 97% of Child A in the study by Cheng et al. This implicated the rational application of TACE in selected patients with BCLC stage C.
The study’s primary outcome was overall survival in each group. As expected, Child A group, which was the only group to be proved suitable and recommended for TACE, had the best survival. According to the survival curve that compares Child A, B(7), and B (≥8), the log rank test showed statistical difference among the 3 groups. Surprisingly, the survival curve of B (7) and B (≥8) are almost the same. After we explored the log rank test between B (7) and B (≥8), survival did not differ. In the subgroup analysis of Child score 9, we compared Child B(9) with Child B(7–8) and Child A. The survival curves differed significantly among the groups and the curve of Child B(9) was the worst and tended to go separately from the curve of Child B(7–8). We then compared B(9) and B(7–8) but a statistical difference was not met. The small number of patients in group B(9) (n=11) might have contributed to this insignificance despite a trend in the survival curve. This study did not include patients with de compensated cirrhosis who did not receive TACE as a control group due to the retrospective nature of the study. We used the data from the RCT of Lo et al.,5 which showed 1- and 2-year survival in the TACE group as 57% and 31%, respectively, which was close to our patient population (59 and 41% for 1- 2-year survival, respectively). In that study, the 1-year survival rate for the non-treatment group was 32%. Therefore, the 1-year survival rate less than 32% in Child B (9) was considered not beneficial. From our study, TACE can be performed in patients with Child B (7) as well as Child B (8). These groups of patients represent patients with early de compensated cirrhosis. However, patients with Child B (9), which represents advanced de compensated cirrhosis, have a poor prognosis after TACE, so TACE is not recommended. This finding corresponds to the current Thai HCC guideline. To increase patient survival, serum albumin, and tumor size are factors that should be considered in selecting suitable patients for TACE. High serum albumin and tumor size ≤5 cm provide good candidates. TACE with other treatment modalities increases survival. During treatment, patients who can tolerate more than 2 TACE treatments or do not have complications in 4–8weeks after TACE have better survivals. There are some limitations in this study. First, this is a retrospective study. Second, the number of patients with Child B (9) was low and could contribute to the statistical insignificance in survival compared to Child B(7–8). Third, there was no control group (ie, non-treatment group with the same Child score). TACE can be performed in HCC patients with early de compensated cirrhosis (Child-Pugh score 7–8) resulting in a 1-year survival close to that of Child A. Regarding conflicting Child-Pugh score recommendation for TACE, our study suggests that TACE can be performed in patients with Child score of up to B8. We thank the personnel in the Division of Interventional Radiology, Department of Radiology, Faculty of Medicine, Prince of Songkla University for performing TACE in our HCC patients. Heimbach J, Kulik LM, Finn R, et al. Aasld guidelines for the treatment of hepatocellular carcinoma. Hepatology. 2018;67(1):358‒380. EASL-EORTC clinical practice guidelines: management of hepatocellular carcinoma. J Hepatol. 2012;56(4):908‒943. Omata M, Cheng AL, Kokudo N, et al. Asia-Pacific clinical practice guidelines on the management of hepatocellular carcinoma: a 2017 update. Hepatol Int. 2017;11(4):317‒370. Llovet JM, Real MI, Montana X, et al. Arterial embolisation or chemoembolisation versus symptomatic treatment in patients with unresectable hepatocellular carcinoma: a randomised controlled trial. Lancet. 2002;359(9319):1734‒1739. Lo CM, Ngan H, Tso WK, et al. Randomized controlled trial of transarterial lipiodol chemo embolization for un resectable hepatocellular carcinoma. Hepatology. 2002;35(5):1164‒1171. Llovet JM, Bruix J. Systematic review of randomized trials for un resectable hepatocellular carcinoma: Chemo embolization improves survival. Hepatology. 2003;37(2):429‒442. Camma C, Schepis F, Orlando A, et al. Transarterial chemo embolization for un resectable hepatocellular carcinoma: meta-analysis of randomized controlled trials. Radiology. 2002;224(1):47‒54. Pawarode A, Tangkijvanich P, Voravud N. Outcomes of primary hepatocellular carcinoma treatment: an 8-year experience with 368 patients in Thailand. J Gastroenterol Hepatol. 2000;15(8):860‒864. Sithinamsuwan P, Piratvisuth T, Tanomkiat W, et al. Review of 336 patients with hepatocellular carcinoma at Songklanagarind Hospital. World J Gastroenterol. 2000;6(3):339‒343. Somboon K, Siramolpiwat S, Vilaichone RK. Epidemiology and survival of hepatocellular carcinoma in the central region of Thailand. Asian Pac J Cancer Prev. 2014;15(8):3567‒3570. Leerapun A, Thaikruea L, Pisespongsa P, et al. Clinical features and prognostic factors for liver cancer from a referral center in northern Thailand. J Med Assoc Thai. 2013;96(5):531‒537. Chonprasertsuk S, Vilaichone RK. Epidemiology and treatment of hepatocellular carcinoma in Thailand. Jpn J Clin Oncol.2017;47(4):294‒297. Dufour JF, Bargellini I, De Maria N, et al. Intermediate hepatocellular carcinoma: current treatments and future perspectives. Ann Oncol. 2013;24 Suppl 2:ii24‒29. Bolondi L, Burroughs A, Dufour JF, et al. Heterogeneity of patients with intermediate (BCLC B) Hepatocellular Carcinoma: proposal for a subclassification to facilitate treatment decisions. Semin Liver Dis. 2012;32(4):348‒359. Kothary N, Weintraub JL, Susman J, et al. Transarterial chemoembolization for primary hepatocellular carcinoma in patients at high risk. J Vasc Interv Radiol. 2007;18(12):1517‒1526. Piscaglia F, Terzi E, Cucchetti A, et al. Treatment of hepatocellular carcinoma in Child-Pugh B patients. Dig Liver Dis.2013;45(10):852‒858. Yamakado K, Miyayama S, Hirota S, et al. Sub grouping of intermediate-stage (BCLC stage B) hepatocellular carcinoma based on tumor number and size and Child-Pugh grade correlated with prognosis after transarterial chemo embolization. Jpn J Radiol. 2014;32(5):260‒265. Cheng AL, Kang YK, Chen Z, et al. Efficacy and safety of sorafenib in patients in the Asia-Pacific region with advanced hepatocellular carcinoma: a phase III randomised, double-blind, placebo-controlled trial. Lancet Oncol. 2009;10(1):25‒34. © 2018 Cheewasereechon et al. This is an open access article distributed under the terms of the Creative Commons Attribution License , which permits unrestricted use, distribution, and build upon your work non-commercially.